The college basketball endgame can be a painful experience for viewers. 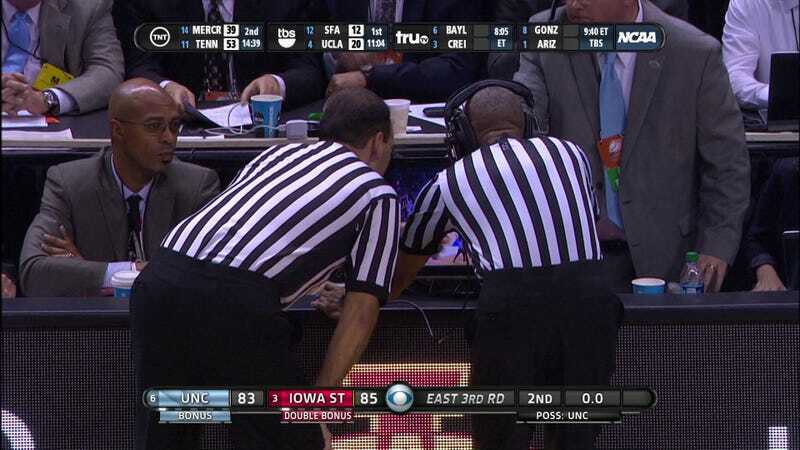 With repeated fouling, free throws, and referees' video replay reviews, the final 60 seconds of this year's NCAA tournament games have drawn criticism from mavens and columnists both large and small. Do the critics have a point? How much time of an NCAA tournament game is really taken up by the final minute? To answer this, we looked at all 52 games of March Madness so far and calculated how long it takes to play 60 seconds of basketball when those 60 seconds are the last 60 seconds. Overall, the last 60 seconds of the 52 games combined have taken five hours, 44 minutes, and 51 seconds to complete. (That's including the five bonus final minutes from overtime games.) 5:44:51 is 605 percent longer than realtime; the average final minute took 5:57 to finish, with a median of 5:29. The longest final minute in the tournament so far happened in the Oregon-Wisconsin matchup, a game that entered the final 60 seconds with a two-point margin and emerged, 15 minutes and seven seconds later, with an eight-point Wisconsin win; more than 10 percent of the entire game's length, including halftime, was spent on the last minute of clock. That wasn't enough to make it the tournament's longest non-overtime game, though; that title belongs to Dayton-Syracuse—which ran 2:27:42 thanks to a 14:09 final minute that started with a three point score margin. The dotted blue line refers to Bill James's "lead is safe" calculation, and you'll see that teams tend to play out the final minute along its proposition—either consciously or unconsciously. There's nothing especially noteworthy about those two outliers, other than that coaches Rick Barnes and Bruce Weber continued to call timeouts despite their teams' statistical impossibility at winning. To be fair, many sports suffer their own brand of "not much sports in this sports telecast." The WSJ once found that the average NFL game contains just 11 minutes of actual football. But consider that first graph above again. The standard programming metric for the length of a college basketball game is two hours. Of the 52 games thus far, only nine have actually fit into that window. To put this into perspective, consider a few things; First, that in a 40-minute basketball game the final minute should, in a vacuum, take up about 2 percent of the game's total time. That's factoring in halftime and the rule that stops the clock in the final minute after a made basket. Fifteen games clocked in with a final minute less than this; the closest of them was Florida's 12-point win over Albany. It would take four days, 18 hours, 37 minutes, and 36 seconds to watch all 52 games beginning-to-end. The average game length was 2:12:16. While there's no statistical correlation between winning team's score or total score and game length, there is a statistically-significant correlation between the losing team's score and overall length of the game, being that as the losing team scores more, the game runs longer. Update (March 29): We've updated the below chart with the Sweet 16 games. They were, as a whole, considerably longer in the final minute than the previous 52. The Tennessee-Michigan game, in particular, had a longer final minute than the combined final minutes of three different overtime games, and was easily the longest single final minute at 18:09—a whopping 14% of the entire game, including halftime. Three of the eight games dedicated more to the final minute than any other regulation games of the tournament to this point.